Three Anglers Fined a Total of $3,000 for Fishing too Close to a Fishway. Three Greater Toronto Area residents have been fined a total of $3,000 for illegal fishing in Etobicoke Creek in Toronto. Angelo Gori and Bryone Kevin Gillard of Toronto and Artur Tomasz Pachol of Mississauga pleaded guilty to fishing within 25 yards downstream of a fishway at Etobicoke Creek and were each fined $1,000. 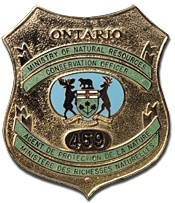 The court heard that on the afternoon of April 17, 2013, a Ministry of Natural Resources conservation officer found the men fishing right below the downstream edge of a dam, known locally as the old broken dam at Etobicoke Creek in Toronto. This dam acts as a fishway allowing fish to travel upstream to spawn. Pachol was fishing from the west shore, Gillard and Gori from the east shore. Justice of the Peace Frank Devine heard the case in the Ontario Court of Justice, in Toronto, on June 13, 2013. Migratory fish, such as trout and salmon, congregate below dams, fishways and obstructions making them vulnerable to illegal fishing activities. Fish congregate in these areas to rest or to stage until conditions are suitable for further migration. To report a natural resources violation,call 1-877-TIPS-MNR (847-7667) toll-free any time or contact your local ministry office during regular business hours. ← Forest Company Fined $9,900 for Unlawful Sale Of Aggregates.